“SpeedUpMyComputer” (by “SmartTweak”) is a Rogue optimization software that gets on your computer as bundled software when you download and install other free software from the Internet. When “SpeedUpMyComputer” is installed on your computer, it runs on Windows Start-up and asks to enter (buy) a serial key to activate the program. The “SpeedUpMyComputer” program looks legitimate, but if you want to fix the issues found, then the program demands from you to buy the full version in order to continue. How to get rid of “SpeedUpMyComputer” Rogue software. 3. Click at “Quit” button. Step 2. 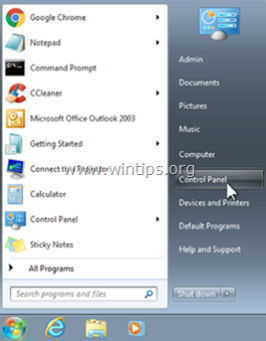 Uninstall "SpeedUpMyComputer” app from your Control panel. Any other unknown or unwanted application. Step 3. Remove “SpeedUpMyComputer” entries from Windows Startup. 1. 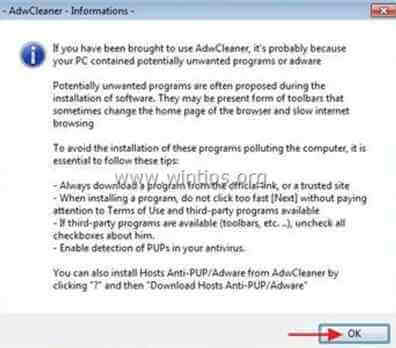 Download and run CCleaner. 2. At “CCleaner” main window, choose "Tools" on the left pane. 3. In "Tools" section, choose "Startup". 2. Delete the “FixMyRegistry” shortcut from your Desktop. 3. Delete the “SmartTweak Software” folder from your programs list. Step 6. Remove SpeedUpMyComputer with Malwarebytes Anti-Malware Free. 5. When the removal of infected objects process is complete, "Restart your system to remove all active threats properly". Step 7. Restart your computer & perform a full scan with your original antivirus program.